"Today, we'll learn how to make Chickpeas Dip - Hummus," said Isha. "It might not look like commercially sold dips, but it will taste every bit as good." "It is quite simple to make, since it is just a cold Middle Eastern puree made by blending chickpeas, sesame seeds, garlic, olive oil, lemon juice, and salt." "Chickpeas have been eaten for centuries in the Middle East, and are a good source of protein and dietary fiber. They are reputed to be high in iron and vitamin C and also have significant amounts of folate and vitamin B6." 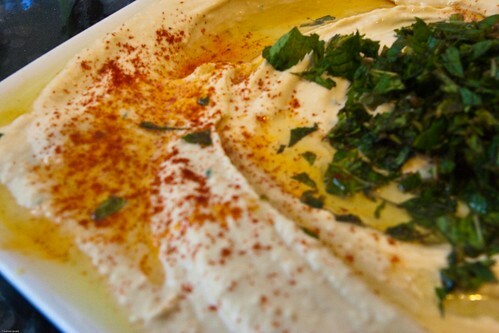 "Hummus is actually an Arabic word itself, meaning 'chickpeas'. It has now become world-famous, because of its use as a dip or spread, eaten on bread, or with nibbles and snacks." "I washed chickpeas under running fresh water yesterday," she continued giving him cooking tips, "until the water was clear. Then I soaked them overnight in brine, in a covered pot. Some cultures soak them using baking soda along with salt too." "If not soaked overnight, they take longer to cook. Or else, you can cook them in a Pressure Cooker. I find cooking in Pressure Cookers makes them mushy." “This afternoon, I cooked them in their overnight soaking solution. When they were cooked, I drained them and allowed them to cool. I kept the stock for later use. Now, they are ready to be made into puree. So, let's get started." As instructed, Hosh put the chickpeas and other ingredients into a blender (or mini wizz). “How do you know when it's done, Ma,” asked Hosh. "And how long will it keep?" "It is important to cook the chickpeas until they are tender," replied Isha. "But you can blend them until their texture is to your preference. I like to blend the puree until it is smooth, but some cultures like it coarse." They garnished it with mint and served it fresh with celery sticks, carrot sticks, baby carrots, potato crisps, crackers and corn chips that night for starters. Light music was playing in the background. Josh turned off the lights and the family dined in candle-light as they chatted. There was contentment, that only companionship, ambience, music and good food can produce together in a home.